Appetisers and finger foods are my favourite types of dishes! I love to eat them, and I love to serve them to others. They’re particularly special because they are so small, and every bit of deliciousness is contained in those one or two mouthfuls. 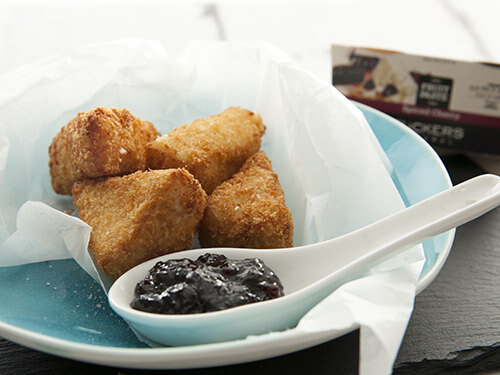 As my husband tells me, “Each bite needs to be a taste sensation.” And this Deep Fried Camembert Appetiser is no different! 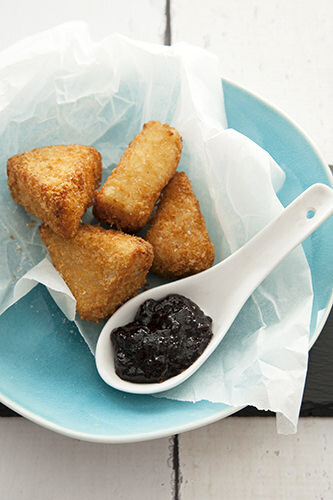 The appetiser that still makes my eyes roll back in my head in anticipation is deep fried camembert. Before you make jokes about me resurrecting this 1980’s food trend. I need a moment to defend myself. 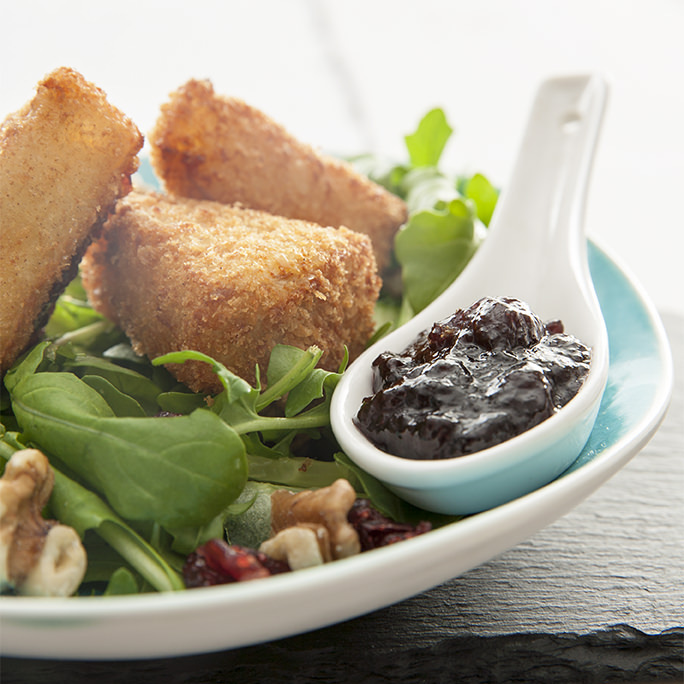 The reason deep fried camembert was a food trend, and was available in every restaurant in every street was because it is GOOD! It’s deep fried! Everything deep fried tastes good, whether you want to admit it or not! It just does! It contains delicious molten cheese! Melted cheese is amazing! It’s so easy to make! Make them ahead of time and keep them in the freezer until needed! The only 3 entrees on every single restaurant menu were garlic prawns in oil, deep fried camembert and pumpkin soup. Yes, you CAN get too much of a good thing. I think enough time has past now that we should embrace this appetiser and do justice to the dish once again. I need to add a little disclaimer to the above statement. They are so easy to make… that you might want to be careful not to get distracted and burn down your kitchen. Are they simple to make? Yes! Can you burn down your kitchen? Absolutely! Is it worth the risk? Absolutely! For those of you that are concerned that I burned down my new gorgeous new kitchen, fear not. This is a faux pas from about ten years ago. I was preparing the camembert as an entree for a dinner party. Some guests came to the door, and when I greeted them I completely forgot I had the oil heating in the frying pan. After a few minutes I did notice a delicious smell coming from the kitchen. I gave myself a mental pat on the back for cooking such a amazing smelling dish before I realised I hadn’t started preparing any food yet! I launch myself into the kitchen in time to see flames growing out of the pan and up into the overhead cabinets. The fire was contained and then extinguished, and we were able to continue with the dinner party. I didn’t make a second attempt at cooking the deep fried camembert, we went straight on to mains that night! This is my first attempt at making deep fried camembert since that fateful night. Although for safety sake, I enlisted the assistance of a thermostat controlled deep fryer. It may have taken some of the excitement away from the dish but my kitchen survived. Place the flour into a freezer bag. Place the panko crumbs into a separate freezer bag. Add the egg to a bowl and whisk. Cut the camembert into 8 wedges. Put two pieces of camembert into the flour. Hold the bag closed and shake to cover the cheese. Remove the cheese from the bag and tap them to remove excess flour. Drop the two pieces of cheese into the egg and coat with the mixture. Remove the cheese from the egg and drop them into the panko crumbs. Ensure the cheese is well covered by the crumb. Remove the cheese from the crumb. Repeat until all the cheese is crumbed. 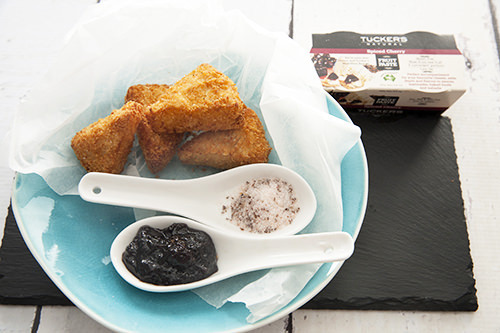 Place the crumbed camembert in a ziplock bag and place in the freezer until needed. I like to fry my camembert when it's frozen. Heat the oil to 180 degrees celsius. Drop a crumb in the oil to test readiness. Cook the camembert until golden brown and floating. 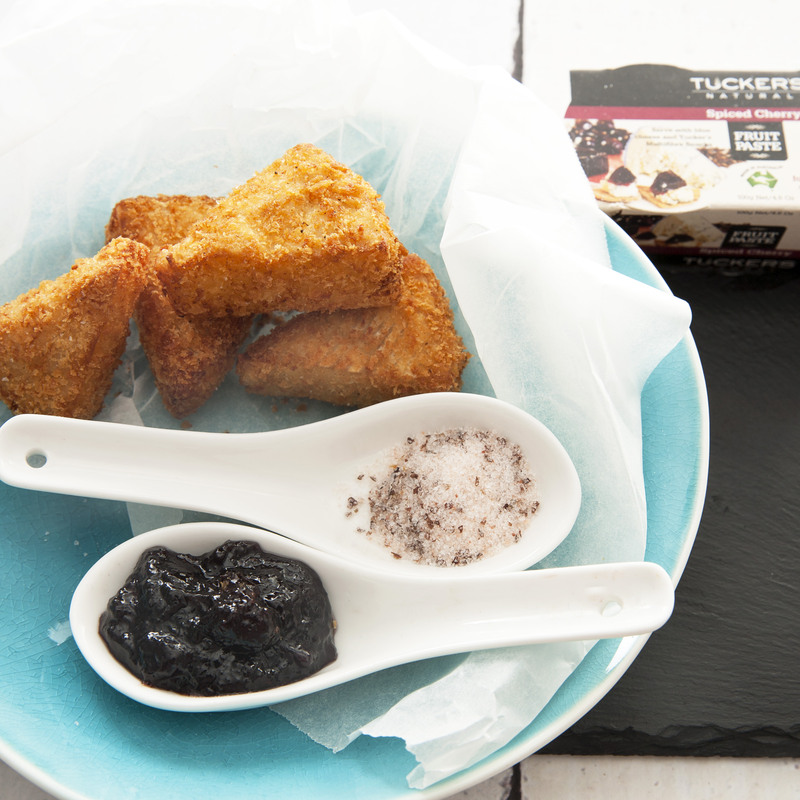 Drain the camembert on absorbency paper and then serve with the Tuckers Natural Spiced Cherry Fruit Paste. Arrange four serving plates with the rocket. Add the cucumber and avocado to the plate. 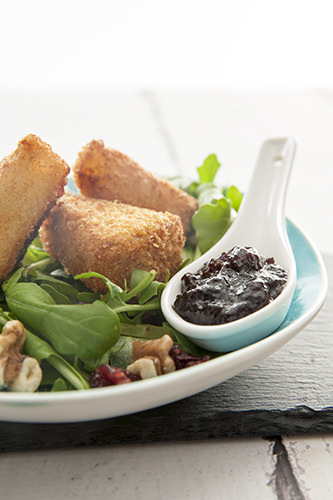 Arrange two wedges of the deep fried camembert on top of each of the salad. Sprinkle the plates with the craisins and walnuts. Combine all the dressing ingredients in a small jar. Shake the jar until the dressing is combined. 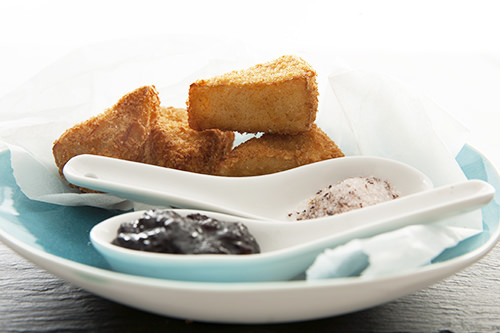 The first pictures show the camembert served as part of a finger food style appetiser. 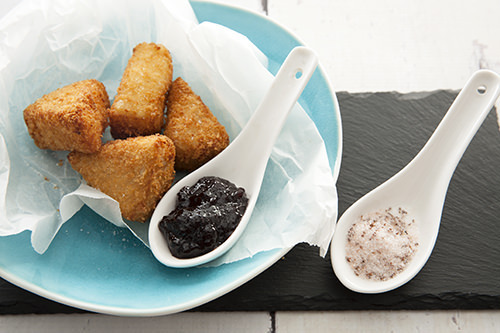 I served the crispy camembert cheese with the a Spiced Cherry Jam. 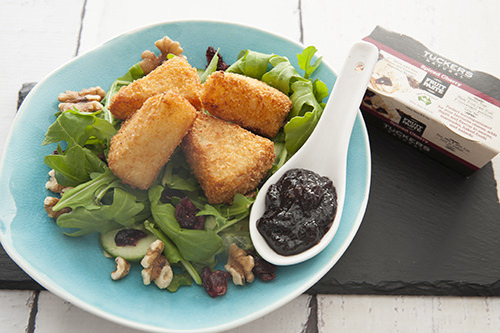 The flavours of the spicy cherry, and the creamy molten camembert go really well together. I also think cherries are a particularly nice flavour to have at Christmas time. My second thought was to make the camembert part of a sit down meal. I have added a salad to the camembert and it is now a delicious salad entree. I wanted to keep with the Christmas feel so I used dried cranberries (craisins) and walnuts to make the salad a little more festive looking. I wanted to keep the spiced cherry flavour as it is the “taste of Christmas” for me at the moment so I made a dressing from the Spiced Cherry Jam. The flavour was sublime on the salad. I wonder if you are ready to brave this retro appetiser after my story? 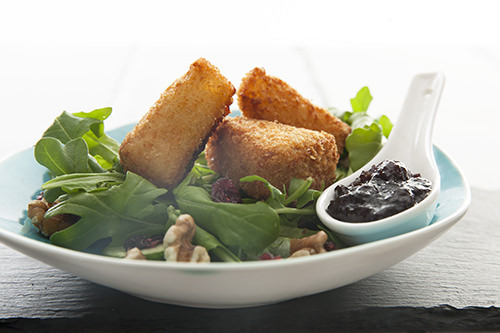 I promise, deep fried camembert tastes so good when you choose your favourite cheese, and coat it in panko crumbs. To serve, all you need to make it a taste sensation is a good quality fruit jam. Have you had any major kitchen mishaps? Are there any other retro dishes you think we should bring back into fashion?